The legendary Grand Hotel Wien, member of the Leading Hotels of the World, is one of the most modern und luxurious hotels in Austria. Its location in the heart of Vienna, directly at the famous „Wiener Ringstraße“, just a few steps to the Vienna State Opera and the „Kärntner“ Street is incomparable. The 5-star-deluxe-hotel combines noble ambience, best service and gourmet cuisine.The 205 luxurious and technically state-of-the-art rooms and suites guarantee comfort and well-being. Even the expectations of the most demanding guests are met at the Grand Hotel Wien.Guests can enjoy culinary delights in three restaurants and two bars. Highlights are the traditional Japanese restaurant “Unkai” and the restaurant “Le Ciel”, both decorated with numerous awards. The rooftop terrace has a particularly nice ambience in the summer. High Speed Internet access and W-LAN is available in every room free of charge. The fitness centre and the business centre are open 24 hours a day. 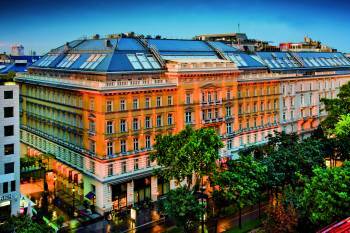 The Grand Hotel Wien is the only hotel in Vienna with a direct access to a parking garage and the luxurious shopping mall “Ringstraßen Galerien”. The Grand Hotel Wien offers 12 function rooms, seven with natural daylight, on 1300m². The “Quadrille” ballroom (456m²) presents itself in the style and the elegance of “Belle Epoque” with crystal chandeliers, wall covering made of hand-woven damask, and precious woods in a harmonious symbiosis with state-of-the-art conference technology. Conferences with simultaneous interpreting, product presentations with light shows, and press conferences will find an ideal backdrop here.The meeting rooms, equipped with state-of-the-art technology including Wireless LAN access. The rooms are perfectly applicable for meetings with up to 400 participants. Modern furnishing, best equipment and personal service guarantee successful and smooth running meetings.